So, the iPhone 8 rumors have been aplenty. We’ve seen schematic leaks, render leaks, various little tidbits that are purportedly the phone’s guts, as well as manufacturers talking about the new handsets’ features. Currently, the story still suggests that there will be 3 new models unveiled in 2017 – the iPhone 7s and iPhone 7s Plus, which will retain a similar design to the 2016 devices, and the mysterious iPhone 8, with an all-screen front and vertical dual camera module on the back. Of course, out of the three, it’s the iPhone 8 that garners the most attention, and is the one most-often leaked. We’ve seen so many mockups, allegedly based on leaked real schematics, that we may just have a pretty good idea what it’s going to end up looking like. Case manufacturers are also feeling confident in the information they’ve been able to obtain about the upcoming Apple flagship and have started making models for it. 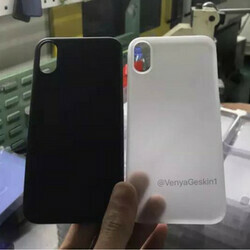 In this latest leak, serial leakster Benjamin Geskin shows us a couple of iPhone 8 cases that have allegedly entered mass production – which would mean that the manufacturer is 100% certain of the iPhone 8’s size and proportions. The photos reiterate a lot of what we’ve been seeing time and time again – a vertical dual lens camera, a power button that is larger than the volume up and down keys (up until now, the power button was of the same size), and an overall size of the phone being slightly larger than the currently available iPhone 7 and noticeably smaller than the iPhone 7 Plus. The iPhone 8 is rumored to have a 5.15-inch display, but since its bezels are expected to be super-thin, its body will not be much bigger than the one of the current iPhone 7, rumors insist. Please Apple, don't do that!!! he's crying because that case cover apple logo..
That's not big at all but I wonder what the true usable screen space is. Such a big camera. Some new feature they bringing. I am just thanking the Apple Gawds ....there is no FP Reader on the back side of the iPhone 8 case! The best is about to get even better. Can't wait! Kind of sad the iPhone 8 is growing substantially, compared to the 7. Same fake nails as the dummy unit leak. Same employee?